Amardeep Singh: Melodrama in Milwaukee: a Review of "American Dervish"
Melodrama in Milwaukee: a Review of "American Dervish"
When the topic of South Asian diaspora fiction came up on blogs like Sepia Mutiny (or now, happily, The Aerogram) the conversation would inevitably come around to Jhumpa Lahiri--though not always entirely happily. Many readers have complained over the years that Lahiri’s characters are too narrowly of a certain class and milieu – highly educated, upper-middle class Bengalis. Where, many readers wonder, is the second-gen novel that sounds more like ‘regular’ desi life? Reading The Namesake years ago, I should say that I did not particularly share that frustration, since actually Gogol Ganguli’s experience at Yale resembled my own experience at Cornell in some uncanny ways. The one difference was really the Ganguli parents – Lahiri’s immigrant parents have a sort of stateliness and dignity that the Punjabi aunties and uncles I knew growing up in DC did not exactly have. In contrast to the characteristic quiet in Lahiri’s stories, my experience was most definitely loud: full of melodrama, over-the-top arguments and fantastic fights. 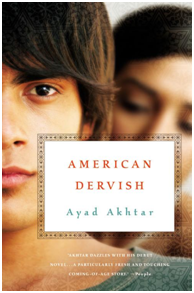 That sense of Punjabi shor-sharabba is something I immediately noticed and found gripping n Ayad Akhtar’s excellent debut novel, American Dervish. Fathers say crazy things after a night’s drinking, wives curse about their husbands’ affairs (“Another of his white prostitutes decided she was sick of his promises!”), and children playing video games in the living room hear it all. Much of what I have written so far pertains to the Punjabi elements of this story. I should also address what is really the core theme of the novel – the boy protagonist’s troubled relationship to religion. Hayat Shah is about eleven years old when his mother’s best friend from Lahore, Mina Ali, comes to stay with him and his parents in the Milwaukee suburbs. Hayat’s own father, a doctor, has turned against Islam in large part because he feels that so many of the observant Muslims in the Pakistani community in Milwaukee are hypocrites or fools. But the boy latches on to his new auntie – and she begins to introduce him to her unconventional brand of Islam, one suffused with elements of Sufism and Mysticism. Hayat’s auntie Mina Ali was divorced by a callous husband in Karachi, and decided to leave Pakistan to avoid having to lose her son to his custody – as, under Pakistani custody laws, she would have been obliged to do. Mina Ali is a curious and paradoxical character – a feminist and freethinker, she is also a devout and committed Muslim who resists the idea of ever marrying a non-Muslim despite her earlier bad experience in Pakistan. Hayat begins to develop an intense pre-adolescent crush on his auntie, which leads him to do some rather unpleasant things to keep her American suitor, a friend and colleague of Hayat’s father, away from her. This forms the core of the novel’s plot, about which I won’t say too much here for fear of giving too much away. What I can say is that his feelings for his Auntie lead Hayat into a pretty intense period of religious study; his immersion in Islam starts as an attempt to please and get close to Mina, but over time it develops a life of its own. One aspect of American Dervish I particularly appreciated was Akhtar’s willingness to “go there” with some serious community dirty laundry. In this case, the particular dirty laundry is the presence of a continuing strain of theological anti-Semitism amongst some Muslims. This is carefully and thoughtfully explored in the novel – it’s one of Akhtar’s central themes. I was also impressed by Akhtar’s willingness to tell hard truths about how religion can be used as a tool for hurting and suppressing free-spirited women in particular. American Dervish is often powerfully – though also subtly – feminist. In the end the young Hayat turns away from the brand of Islam practiced at the local Masjid, but Akhtar eschews the kind of harsh medicine advocated by activists like Irshad Manji. His rebuttal of intolerance within certain strands of Islamic practice is much more nuanced, grounded in the alternative Islamic discourses of the Sufis. Hayat’s solution to the quandaries over religion he faces do not involve rejecting the faith outright, but rather a subtler reorientation to faith that recognizes how deeply our love for the religious beliefs and values of the people we love might impact our own relationship to religion. I should say that I “read” this novel as an audiobook, on my daily long commute to and from work. Part of my pleasure in listening came from its being read so incredibly skillfully – with none of the mispronounced Punjabi or Urdu words one sometimes encounters in audiobook versions of South Asian themed stories. It wasn’t until I reached the acknowledgments track at the very end of the last CD that I realized the audiobook was done by the author himself; Ayad Akhtar’s training as an actor and background as a playwright clearly informs his recorded performance of his novel – with emphasis on performance. (As a side note, Akhtar’s play Disgraced was recently performed at Lincoln Center and well-reviewed by the Times.) Many times I felt so drawn into his verbal portrayal of certain scenes that I decided to wait in my driveway or in the parking lot at the university just to hear how a particular crisis moment might end up playing out. In short, this is a very solid and thought-provoking debut novel and a definite contribution to the rather short list of really good novels about South Asian diaspora life. The audiobook version is so good that it might even be recommended above the text version of the novel. I 'read' the novel via audio-book as well. I found it terrific. In addition to your well thought out review, I'd add that the novel has literary merits that go beyond the 'South Asia' lit criterion. I was very struck by how complex each of his main & even side characters turned out to be. It was almost impossible to completely like or completely dislike any of the characters, even Mina.